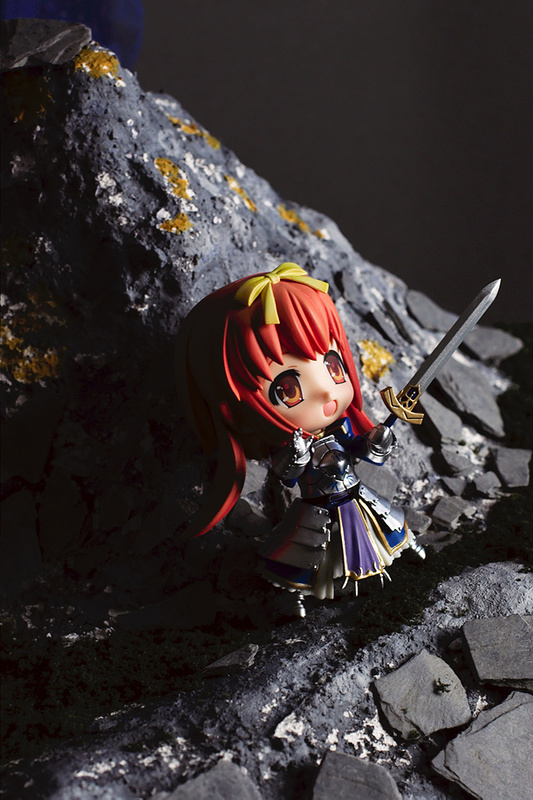 Nendoroid Review for once next time I will return to PVC figures =D . from Good Smile Company which was released in October 2010.
an anime and lately even a Movie called Unlimited Blade Works was made. 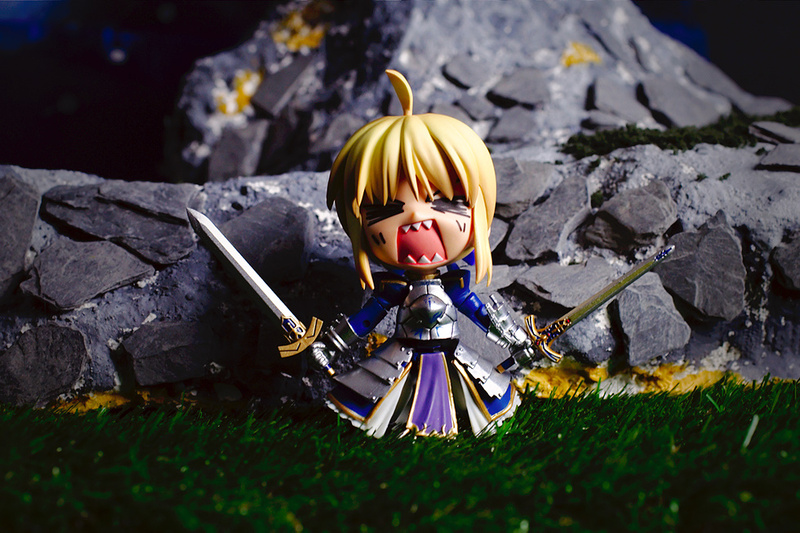 I always was more a Rin fan than a Saber fan and so far I owned no single Saber Figure. 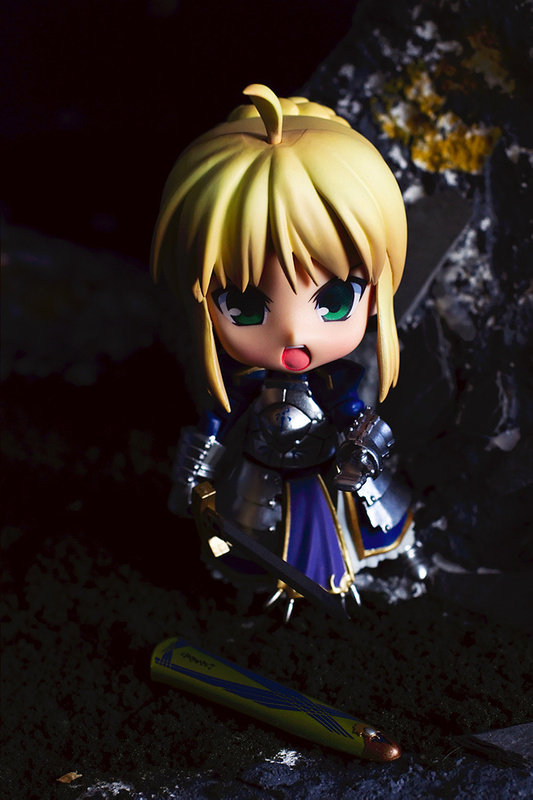 and thought “Ah how cool” after checking the price, Saber landed in my shopping cart. I think the swords and scabbards have special names but I don’t have them in mind. 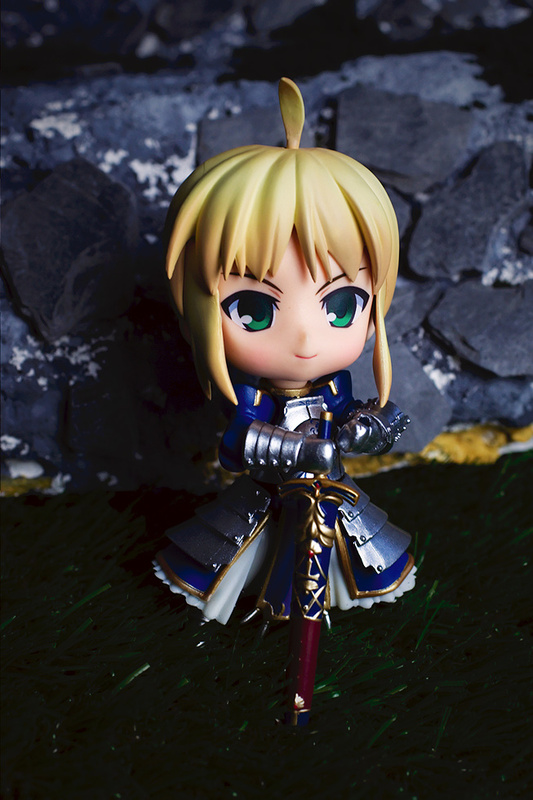 Good Smile Company made many Saber Nendoroids, the special feature of this one is that it is “Super Moveable” which means that Saber has nearly the same articulation like a Figma. You can give her nearly every pose which comes to mind, she has joints at her neck, shoulders, elbows, legs and feet, you can also spread the skirt to the sides. For posing noobs like me these kind of posing freedom is a bit over the top, but I think more Nendoroid experienced or more creative people will have their fun with such a variety of possible poses,the only limiting factor is her head and the length of her arms. 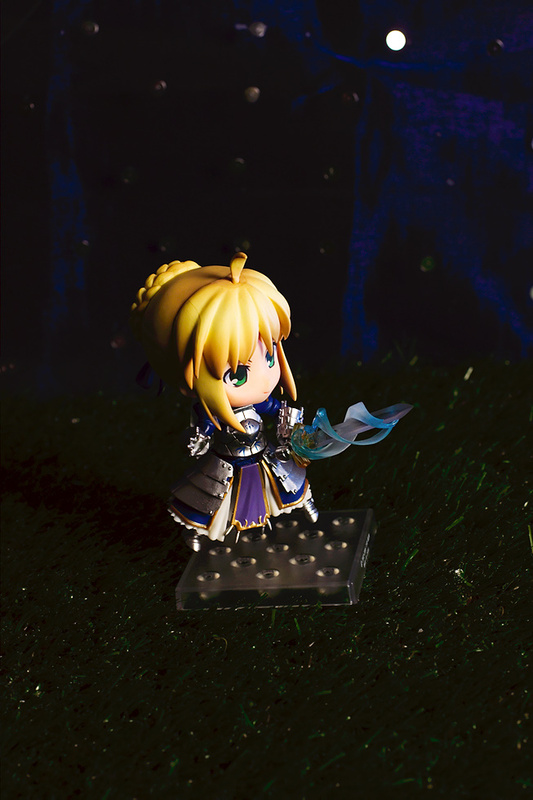 Saber is the first kind of moveable Nendoroid, so I didn’t know how her moveability would turn out, there were some comments on MFC about loose parts and joints, but I only discovered that her right arm comes off easily when you pose it. 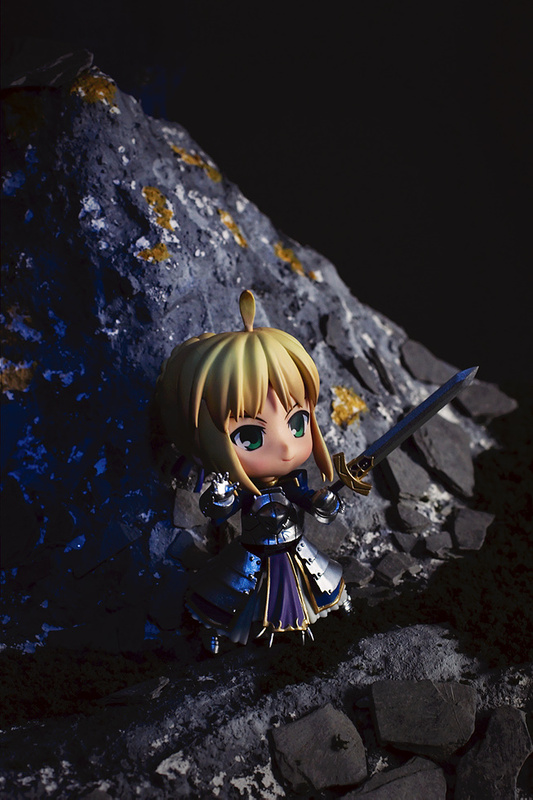 Another nice aspect of this Nendoroid is the base, it’s connects at the back of Saber. 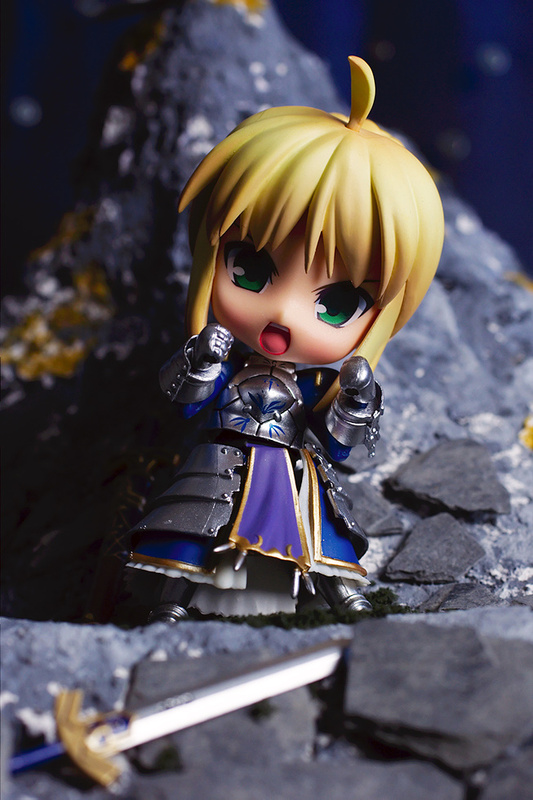 It supports Saber very well and helps you to create cool and dynamic poses. 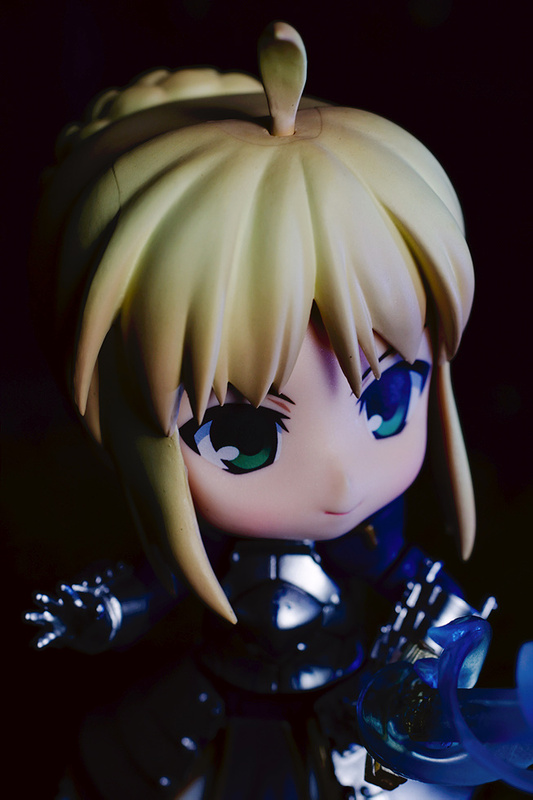 I think the connection at the back is the best way to display a Nendoroid. 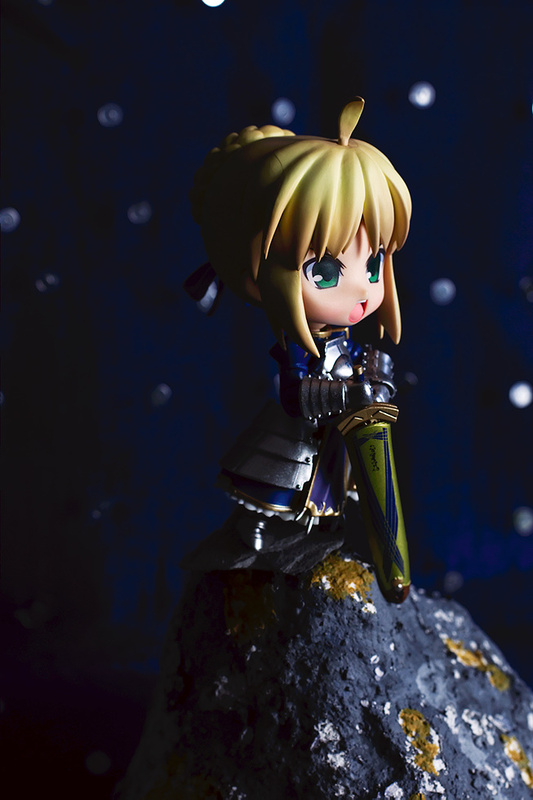 Honestly I’d like to drill a hole in the backs of my two older Nendoroids and equip them with such kind of bases. 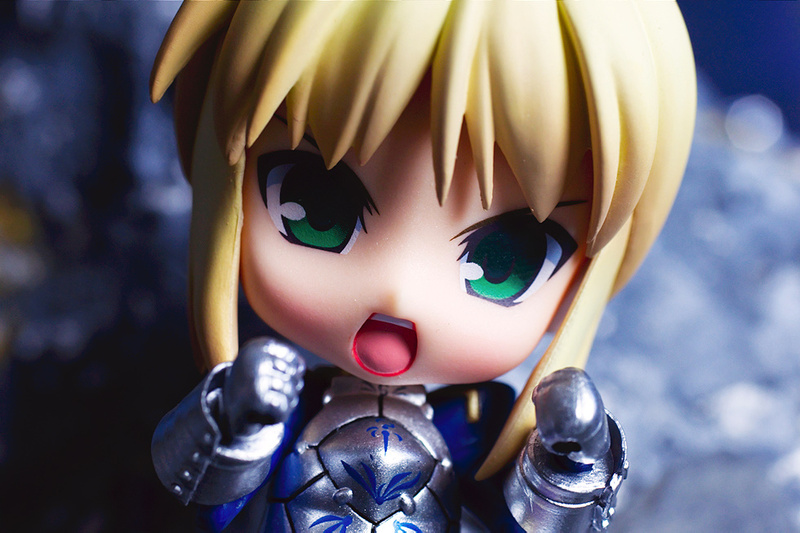 The quality of GSC’s Nendoroids was always very good, after I bought Saber and Amano Tooko which was released at around the same time, I can say that their quality has even increased, the parts fit together perfectly. The paintjob is nearly flawless the same goes for the sculpting. Talking about quality have you heard about the commotion about BRS Anime Version? As GSC was getting flamed when it came out that they forgot to put the star decal on her jacket and gave her beige colored shoe soles, personally I don’t really care about the beige boots nor the missing star I didn’t even know she had a star there until Wednesday. That they’ve forgotten to put on the star is a bit embarrassing, but even if I am no fan of Good Smile Company I felt a bit sorry for them. I will cover my impressions about the BRS Anime Version figure in the next review. 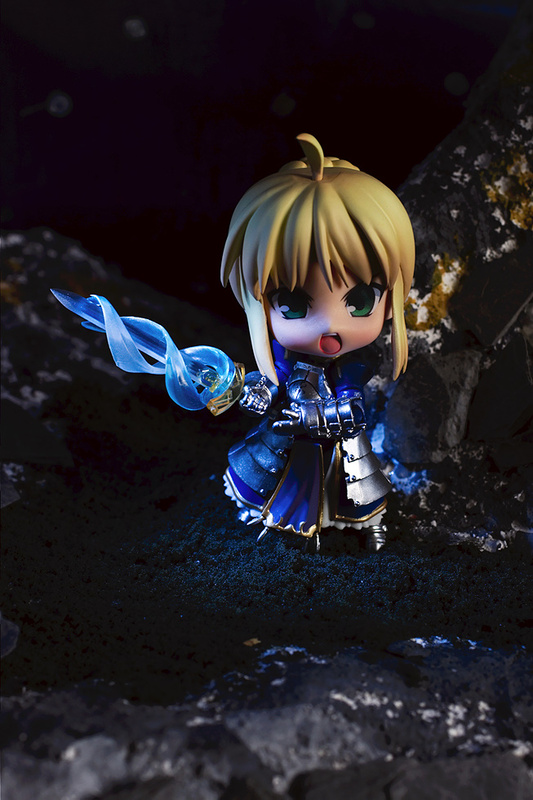 Back to Saber’s outfit, it is very nice and detailed, as I said before she has the same. 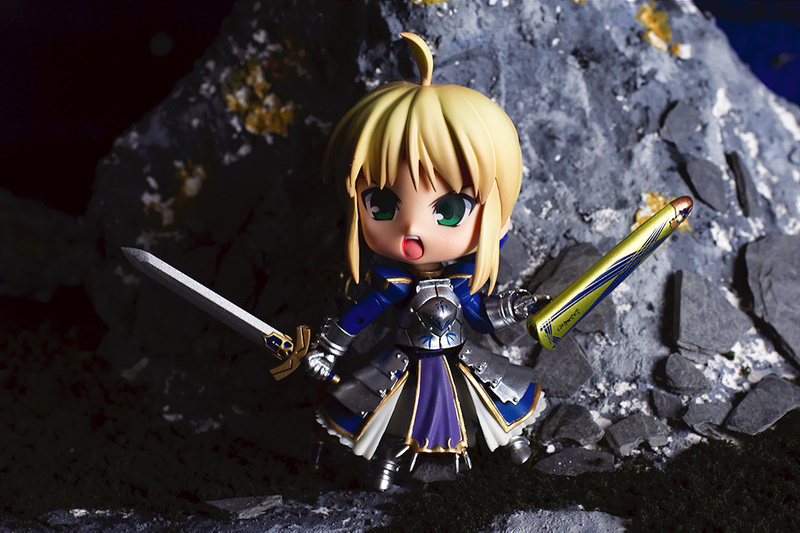 Outfit as the one of the 1/7 scaled Saber Triumphant Excalibur Version. The blue combined with the silver colored parts looks really good, especially the detailed silver colores armor plates are very cool and and I like the slightly shiny metallic paint. 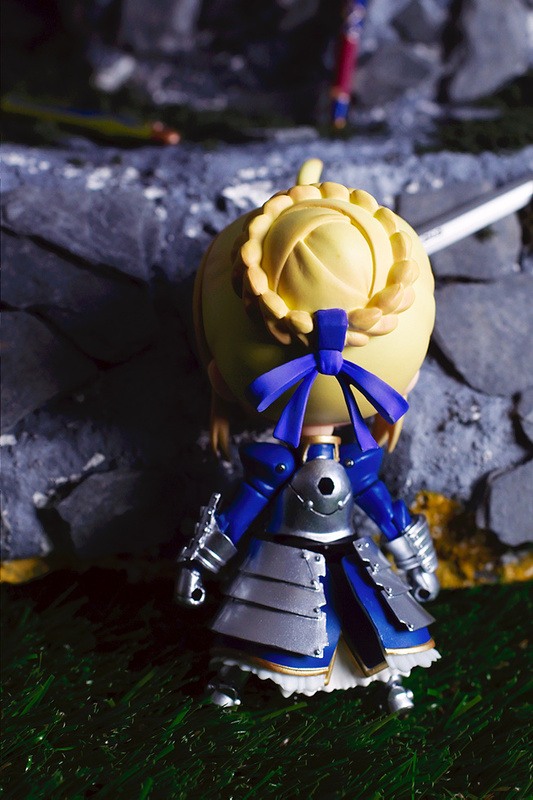 The different layers of her skirt which consist of the outer armor, the blue dress and the white underskirt looks really nice together. I tried to switch the head with another Nendo, but the neck of Sumomo was a bit too thick, to fit in Sabers body so I had to switch the neck peg. 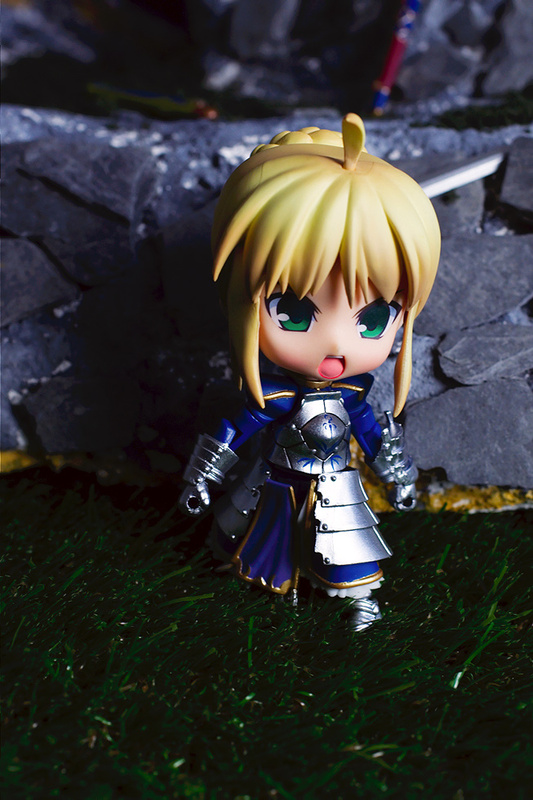 This Saber Nendoroid is a very nice and cool Nendoroid, she offers you a lot of freedom for creating cool and dynamic poses. I am really astonished about the moveability of such a small figure. The paintjob of her outfit looks great with the combination of blue and silver colors. The three different faces are also nice and have diversified expressions, my favorites are the kind and the serious one, Sabers eyes look very nice. 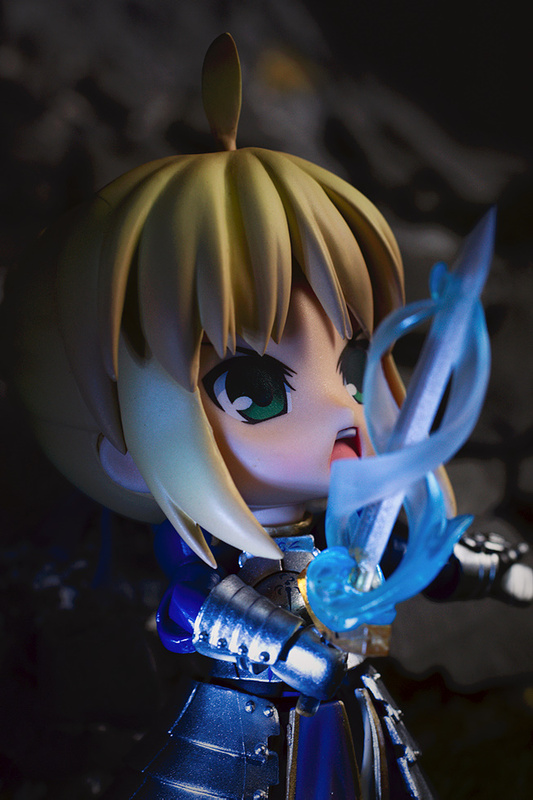 Also the sculpting of this Saber Nendoroid is accurate and very well done. Gorgeous pictures!! I love that rocky background. 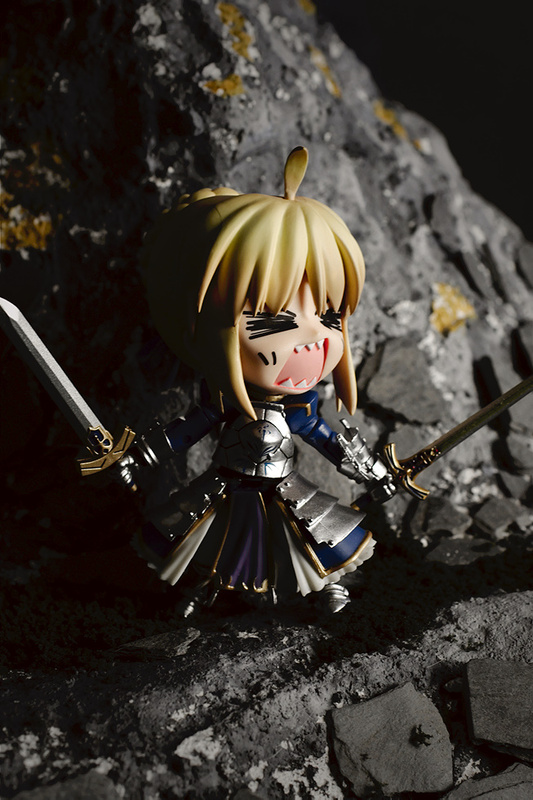 When this nendo was announced I was really curious about it. From the look of your pictures it did turn out to be a quite nice experiment. 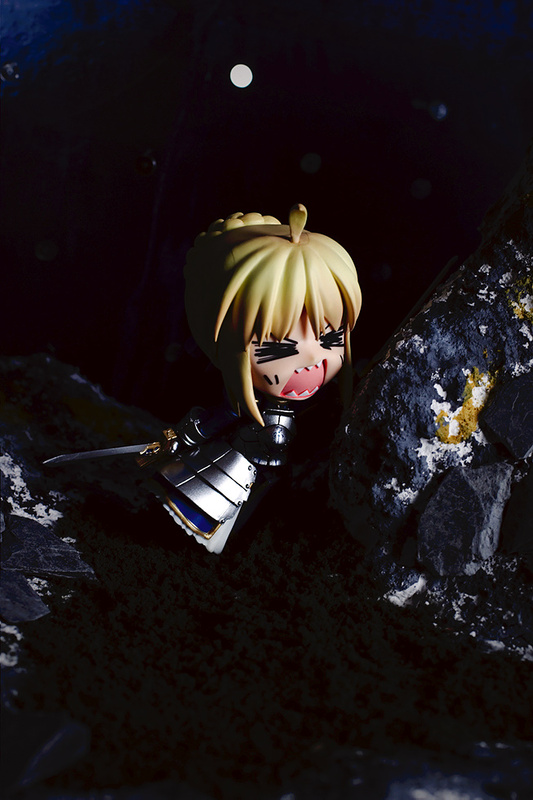 I do wonder if this was mostly a limited kinda thing or the start of a new nendo line. Aww.. 4 weeks SAL.. I will be hoping for photos of her from you, hehe. 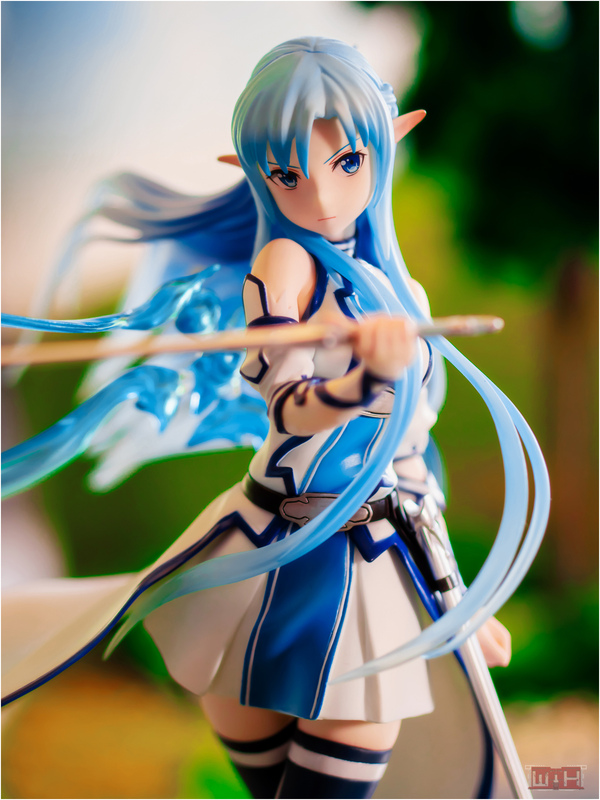 is her hair can attach to other nendoroid ?? or maybe her face/head ? ?